It is renowned for the diversity of its landscapes but it is only since the advent of the railway and the automobile that it has begun to be appreciated by the tourist market. 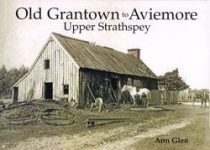 This volume chronicles many of the changes which have occurred since the late 19th and early 20th century including the influence of two world wars, the ever encroaching railway lines and road and bridge building under the auspices of Thomas Telford when he was the Engineer for the Commission for Highland Roads and Bridges. Early photographs of 19th century Grantown, the Nethybridge Hotel which served two competing railway companies, a spectacular view across the valley from Bynack Mor showing Broomhill Station, the old 1717 bridge across the River Dulnain at Carrbridge right next to the new 1818 Telford bridge which replaced it and dramatic pictures of railway carriages in the Baddengorm Burn after the bridge failed in 1914 are just some of the images accompanying Ann Glens informative captions.